Shortly after the political party Vlaams Blok was condemned for racism (2003) many in the media and political circles wanted to now treat the party as a “normal party”. 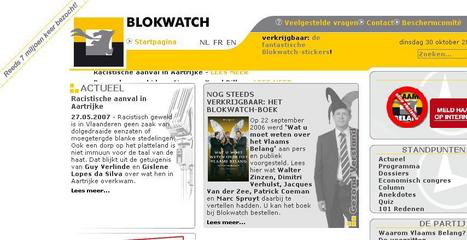 With the independent organization Blokwatch we showed how this party remained the same in spite of its new name (Vlaams Belang) and we launched the at the time biggest political internet petition to finalise the law on party funding – the so-called liberticidewet, educating parties not in accord with human rights by stripping them of public funding. This active citizen initiative was successful. At the same time we launched our website www.blokwatch.be to support the media in reporting on extreme-right and to provide students and researches with all the scientific information gathered on our pages. The website was the main counterweight to the growing number of extreme-right wing websites, and explained the history of neo-fascism and populism to the wider public, especially young people that had hardly ever heard of this history because of yearlong neglect by the traditional media. We also gave lectures in both the Netherlands and Belgium on the rise of the extreme-right in Europe, and many articles found their way to newspapers and TV channels. The best were collected in the Blokwatch book Wat u moet weten over het Vlaams Belang (EPO, 2006 ; What you should know about the Vlaams Belang). Blokwatch received the 3rd prize for Democracy from Democracy2000, as “today the most important source of information on the anti-democratic nature of extreme-right”. The Vlaams Belang would eventually suffer severe electoral loss and Blokwatch would end its intiative, for now.